On September 14th, the long awaited new studio album by Megadeth, The System Has Failed, recorded with drummer Vinnie Colaiuta, bassist Jimmy Sloas and guest soloist Chris Poland, will hit the stores. In addition, Megadeth's back catalougue has just been re-mixed and re-mastered by Mustaine himself, and is currently available worldwide. Indeed, Megadeth is back and sounding better than ever before! Bob Nalbandian: So can you tell us who is the new guitarist for Megadeth? 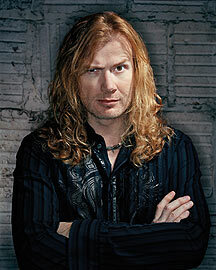 Dave Mustaine: His name is Glen Drover. He played with King Diamond and is in a band called Eidolon from Canada. BN: How did you hook up with Glen? DM: The webmaster for my website had talked to me about a couple guys and Glen's name popped up, we did some research and it was a perfect fit. BN: So is Glen gonna be doing the tour as well? BN: Are any of the tour dates confirmed? DM: It's probably going to start in October, the first leg will be in America, we may do a second leg [in the States] but we're gonna really take it easy on this tour. BN: Will Vinnie Colaiuta and Jimmy Sloas [played drums and bass on new CD respectively] be doing the tour as well? DM: They're not doing the tour. I got Nick Menza back on drums and I haven't yet confirmed the bass player for the tour. BN: Great to hear you got Nick back in the band. How's that working out? DM: It's good, I missed playing with him.